xianghuisportcamerasuit has no other items for sale. I debated off brand vs. Roomba brand batteries. I purchased these in part because my machine is about 4-years old and due for an upgrade/replacement because my 24/7/365 shedding Labrador hair is hard on the Roomba. My Roomba runs for 1.5-2 hours with these new batteries, same duration is new Roomba brand batteries for 1/3rd the cost. It's only been a month so I cannot attest to the life of these batteries but at 1/3 the cost I'm sure it will turn out to be a good economic decision. I got 150-200 charge cycles out of the Roomba brand batteries. I am happy with this product, came quickly and was fully charged. I installed this in my vac and proud to say it runs longer than needed. The vac fills up and talks to you . "Please clean and inspect" so the battery out lasts the vacuum's ability to hold dirt. So then, I think its great to have power to spare because ,I think the battery will last longer if not completely drained every time. I'm also proud to be part of Ebay . my favorite place to shop. Why? Because Ebay always makes it right! If on a rare occasion something is not what was ordered , they are there for you like a friend in time of trouble. I am so pleased with my friends that are always there if I need them. Its a secure feeling that is just perfect in an uncertain world. Battery at a good price? Our Roomba robot vacuum cleaner was slowing down and would only run for about seven minutes before dying. I knew the problem was a dying battery. The rest of the unit was in great shape so I hated to just buy another Roomba. I knew from past experience of buying new factory batteries for my cordless tools that a new battery would be just slightly less than buying a whole new tool. Luckily I checked on E-Bay and found these for a fraction of what a factory battery costs. I was apprehensive at first thinking the low price meant low quality and a short life. I was wrong. 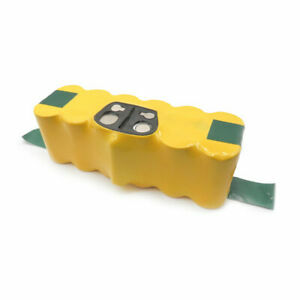 This inexpensive battery made our Roomba immediately start running as if it was brand new! It holds a great charge and runs at least as long as a new factory battery. Installation is very easy, needing only a screwdriver. Anyone can do it and there's even a You-Tube video showing how. It is a great value to breath new life into your sluggish Roomba.